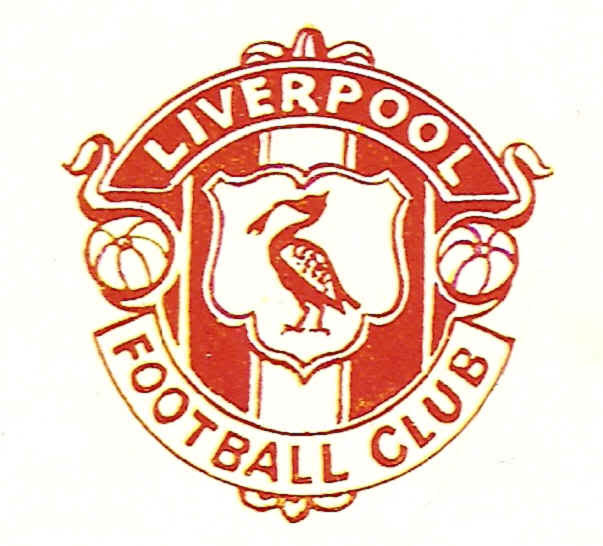 The Liverpool badge has always been pretty straight forward but actually finding some images of the original design has proved fairly difficult !! 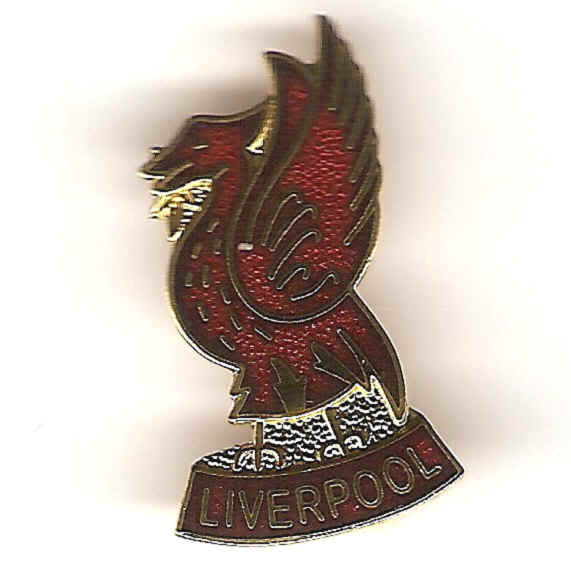 So failing to get some definitive images we’ll just go through the history and try and figure out how the Liverbird emblem came about. There is actually no such bird as a Liver Bird and its emergence as the “emblem” of Liverpool goes as far back as the mid 1600’s. Apparently the story is that Liverpool adopted the Cormorant as its symbol, possibly because that particular species of bird was common in the Lancashire area. Anyway, for some reason the Cormorant then became known as a Liverbird, again, it isn’t documented exactly why that happened but the commonly accepted explanation is because it was Liverpools Bird and was simply shortened to Liverbird. What there isn’t any doubt about is that it became totally linked with both Liverpool as a city and Liverpool Football Club. 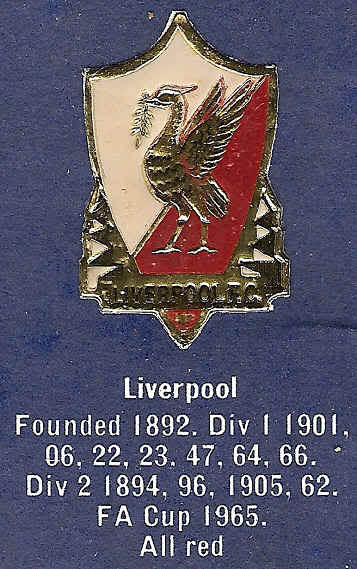 I have found a badge that was part of the Esso Football Badge collection issued in the early 70s which shows the Liver Bird with team name under it, however Esso have been known to use a lot of artistic licence in their reproduction of football badges so again Im not sure if this was the official version. 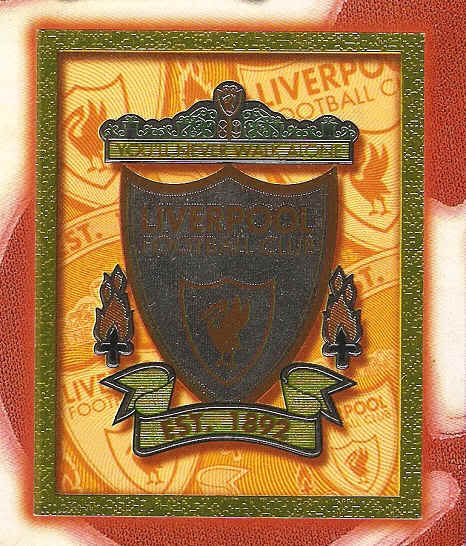 In 1992 Liverpool Football Club celebrated their centenary year and as part of this the badge was redesigned and never can there have been such emotional attachments integrated into a new football club badge design. This was largely down to the addition of 2 “Everlasting Flames” (sometimes known as Justice Flames) on each side of the shield; these were of course added in honour of the 96 Liverpool fans who died as a result of the Hillsborough disaster. Secondly a representation of the Shankley gates were added to the top of the badge with the words “YOULL NEVER WALK ALONE” underneath and Im sure I don’t need to explain what that was all about !! Shown below is a nice example of the badge taken from the Merlin 98 football sticker album, we do actually have these particular stickers for sale on our main Footybits site, as well as the other Esso badges mentioned earlier. So there we are, not the most comprehensive explanation of a badge Im afraid but it’s the best I can do with the info Ive managed to find so if you can fill in the gaps anywhere please get in touch.